They say that lightning never strikes twice in the same place, but that is the very premise of the latest addition to DC Comics’ stable of television shows that avoid its flagship characters. Perhaps that is the key for DC, because its TV shows are a damn sight better than it movies. (Other than Wonder Woman, that is, which single-handedly revived the failing DC Cinematic Universe in my opinion . . . but I digress.) The creators have had great success with Arrow, Supergirl, Legends of Tomorrow, Flash, and now Black Lightning. For those of you not familiar with him, Black Lightning is DC Comics’ second Black superhero overall and its third major Black character, after John Stewart (Green Lantern) and the Black Racer, the second of whom we don’t talk about. (Really. If you’d like to learn why, check out this article for some background.) Black Lightning is, however, DC’s first Black superhero to have their own comic book—and now he’s the first Black DC superhero to have their own television show. As is par for the course in comics, the origin and source of his powers change based on the version of the hero you’re talking about. Initially he had a power belt that gave him electrical powers, but later he’s consider to have “internalized” the powers from the belt because of a latent metagene, and then that’s further simplified to his being a metahuman born with electrical powers. The television show, which wrapped up its first season in April, is currently in reruns, and and has been renewed for season 2, gives its own spin . . . But I’m getting ahead of myself. Before I go further, allow me to warn people who have not watched the show yet. Now we can get down to it. 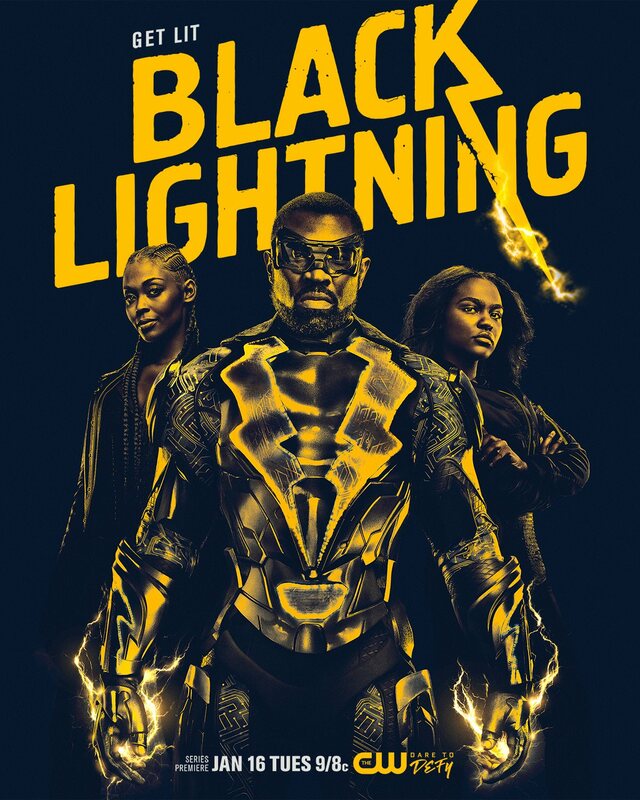 The show begins with Black Lightning coming out of retirement, and over the course of the season we find out the origin of his powers through some flashbacks as well as some exposition and revelation based upon the major story arc. The basics are this: Jefferson Pierce (Cress Williams), also known as Black Lightning, retired and became the principal of the local high school. He and his ex-wife, Lynn (Christine Adams), share custody of their two daughters, who live with Jefferson. Their divorce was predicated on Jefferson’s actions as Black Lightning; Lynn said she could not stand by and watch him kill himself. Now that he’s retired, the opening of the show reveals him trying to win her back. He is happy in his life as a principal and is saving young people through education—and, it is revealed, through a deal with the local gang, the 100, for the school to be a safe zone, free from any criminal activity. His younger daughter, Jennifer (China Anne McClain), is a student at his school, and his older daughter, Anissa (Nafessa Williams), is a teacher there. What brings him out of retirement is the safe zone rule being violated because Jennifer, acting like a stereotypical teenager, gets involved with wrong person: a member of the 100, who doesn’t take it well when she rejects him on discovering he is a member of the gang. The gang member eventually kidnaps both daughters, causing Jefferson to don the mantle once again, this time with a new suit and Lynn’s blessing. He fights the gang, rescues his daughter, and announces his return to superheroism. As the season goes on, we learn about Black Lightning’s origin, what has happened in the family’s life, and the background of the villains, and we see powers emerge in both daughters. I don’t want to give too much of the finer plot lines because you should really check it out for yourself. Now, on initial look, are a lot of formulaic elements here: rebellious daughters, a couple separated by a difference of opinion, a worried love interest who thinks leaving is better than watching the hero get hurt. And sometimes the acting is a little too artificial; James Remar as Peter Gambi delivers a lot of dialogue as if he’s on an old radio show, obvious exposition to explain the action the audience can’t “see.” But what makes this show unique and worth watching are the way it weaves in some of the issues existing in the world today, its unique take on the hero’s journey, and its positive image of a black superhero family, all of whom are excelling in life. The hero’s journey, in this case, happens a little in reverse: a middle-aged superhero comes out of retirement because he’s needed, puts himself on the line to protect people despite the challenges, and, in this case, trains the next generation to carry on. The story as it unfolds is reminiscent of Robert Mayer’s Superfolks, an excellent satire of the superhero genre that also features a middle-aged superhero returning to the fold. Unlike most superheroes, Black Lightning’s alter ego, Jefferson, is already established in the community as the local principal, known and respected as a leader in the community and saving lives through education. He has given up “the life” and settled down, hoping to reconcile with Lynn. He is at peace . . . and then his daughters are abducted. In that quick moment, he discovers that while he may have been done with the superhero life, it isn’t done with him. He is reluctant to return to crime fighting because he wishes to reconcile with his ex-wife, but situations keep arising—ultimately, he knows he cannot escape his destiny and returns fully to the fold. But in doing so he faces new challenges: he learns things that about his mentor that feel like betrayal; he has to adjust to the impact that age has had on his powers and his physical condition; he has to contend with police (one of them a close friend) who don’t want him acting as a vigilante; he has to face his arch enemy, Tobias Whale (Marvin “Krondon” Jones), who, he learns, killed his father. And as if that weren’t enough, his daughters develop superpowers. But perhaps the best reason to watch this is the African American family focus that gives representation of strong Black characters and a strong Black family. Anissa is a lesbian, and when we see one relationship end and another begin, her parents don’t even bat an eye but rather joke about which girlfriend they like and don’t like. She also joins in with community activists and protesters, even using her powers to destroy a Confederate statue. Jennifer is known as the “PK” (principal’s kid) and gets teased by her schoolmates for being too perfect, so naturally she’s trying to rebel, but even then she always falls back on her family’s lessons. Lynn is a successful neuroscientist, which puts her in the right field to study her family’s powers. And throughout everything they remain a family, a positive image among Black characters—and, as a family, a rarity in the superhero world. And to keep it poignant, Jefferson deals with gang violence, drugs, racism, and marginalization. The issues are woven into the show just like they are in real life, and the audience gets a taste of what people of color deal with in their lives. Tobias Whale even emulates Uncle Ruckus from The Boondocks, hating Black people like he’s a member of the Invisible Empire. But through it all, you have this positive image of a Black family who eats dinner together, places education over entertainment, and deals with gangs but never gets compromised by them. And through it all, it is clear that this is Black Lightning, a superhero who in tune with the community and never afraid to step up or step outside in order to serve justice. 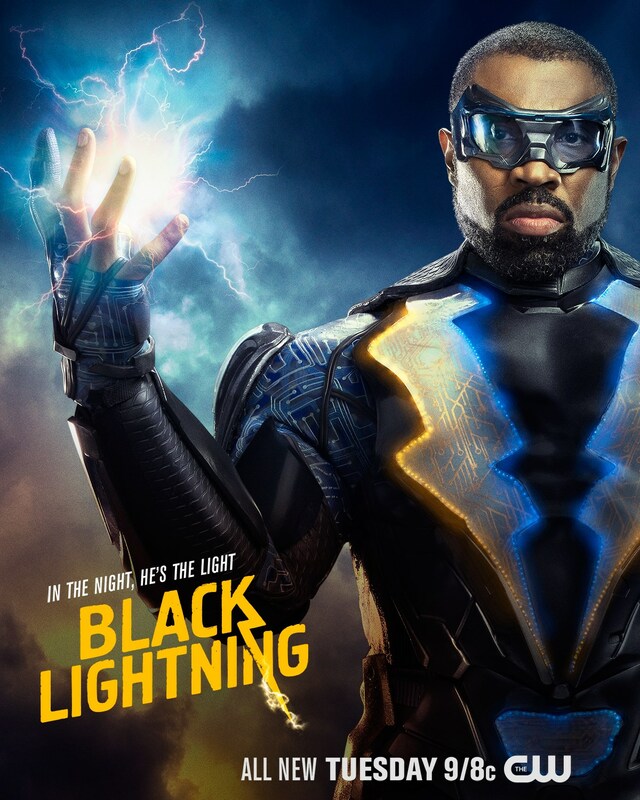 The bottom line is that Black Lightning is a fun show with great diversity (and a phenomenal soundtrack) that you can enjoy on Thursday evenings at 8:00 p.m. Central during summer 2018—the CW started rerunning season 1 on May 24. Check your local listings, and then check out the show.